Mesopotamia is a name for the area of the Tigris–Euphrates river system, corresponding to modern-day Iraq, Kuwait, the northeastern section of Syria and to a much lesser extent southeastern Turkey and smaller parts of southwestern Iran. For more information and facts about the Ancient Mesopotamia, see the fact file below. Most of Ancient Mesopotamia was located in what today is the country of Iraq. Mesopotamia was known as the land between two rivers. The Tigris River ran along the north and the Euphrates River ran along the south. These rivers flow into the Persian Gulf. The area is also known as “The Fertile Crescent”. Mesopotamia was approximately 300 miles long and 150 miles wide. Ancient Mesopotamia is considered the cradle of civilization, because the people of this culture developed many things such as government, written language, religion, agriculture, and cities. The Ancient Mesopotamians developed sanitation techniques, the “Pythagorean theorem, and glass. They revolutionized transportation around 3500 BC by inventing the wheel and were among the first to harness the wind as an energy source by using the sail. The land of Ancient Mesopotamia experienced many floods, but today the area is mostly desert. The flooding was a challenge to the farmers. They had to learn to control and work with it. The invention of irrigation was extremely important, because it allowed the people to plant during the hot, dry season. The fertile land produced crops such as many fruits, vegetables, flax, barley, wheat, and sesame. Sheep, cattle, goats, and pigs were being raised by the farmers. The seeder plow, invented by the Mesopotamians, was a major achievement. It allowed farmers to plow their land and seed it at the same time. Ancient Mesopotamia is where the world’s first cities appeared between 4000 – 3500 BC. Before this time, most of the people lived on farms in the country. City life allowed the people to work together for the common good. It is believed an ancient site, called Eridu, was the first city that was ever created. because it allowed information to be carried from place to place accurately. The Ancient Mesopotamians developed the arch and column. They were masters of construction using bricks made of mud. Brick-making was a major Mesopotamian industry, especially in the south, where wood was in short supply and there was no stone. Over the centuries, rains and shifting sands destroyed much of southern Mesopotamia’s mud-brick architecture. Only crumbled mounds remain as evidence of the great cities that once stood in the deserts of southern Iraq. The Mesopotamian woman’s role was strictly defined. Most girls were trained from childhood for the traditional roles of wife, mother, and housekeeper. They learned how to grind grain, how to cook and make beverages, especially beer, and how to spin and weave cloth for clothing. Around twelve years of age, a young girl was considered ready for marriage. During the earliest years of recorded history, the Ancient Mesopotamians were experimenting with ways to count, measure, and solve mathematical problems. They were the first to give a number a place value and to recognize the concept of zero. The ancient Mesopotamians did not use money, so they developed a system of weights to buy and sell things. They used barley as a measure. Other standard units of weight were the shekel, the mina, and the talent or load. Eventually, silver replaced barley as the medium of exchange. The Ancient Mesopotamians discovered that by observing the movements of the moon, sun and stars, they could measure time, which was important for planting crops and for holding religious festivals. 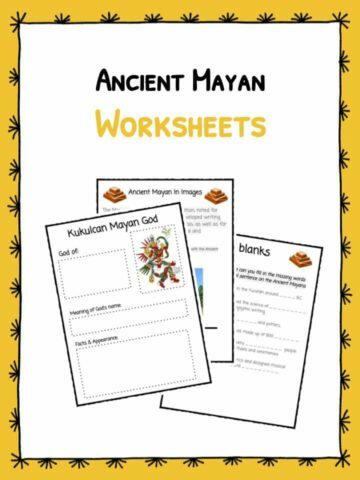 This bundle includes 11 ready-to-use Ancient Mesopotamia worksheets that are perfect for students to learn about the civilisation within the region of Mesopotamia the name for the area of the Tigris–Euphrates river system, corresponding to modern-day Iraq, Kuwait, the northeastern section of Syria and to a much lesser extent southeastern Turkey and smaller parts of southwestern Iran. 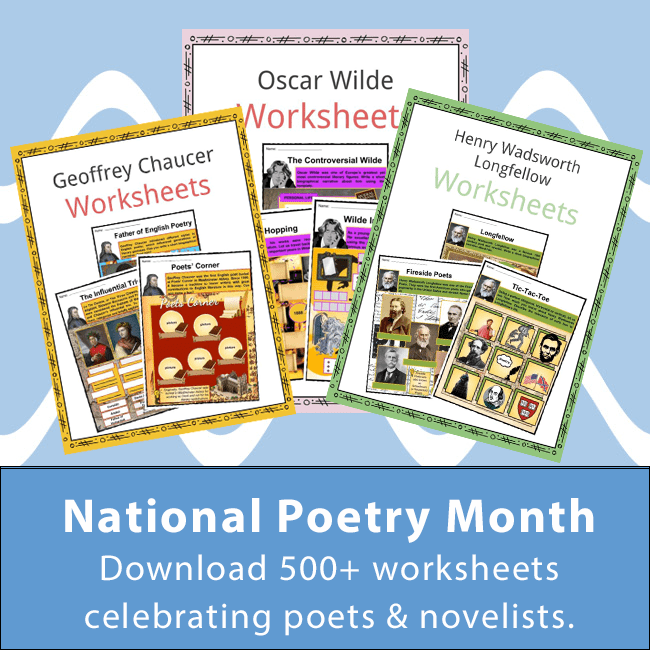 Throughout the extensive worksheet pack there are multiple lesson resources and quizzes for students to practice their knowledge which can be used within the classroom or homeschooling environment. 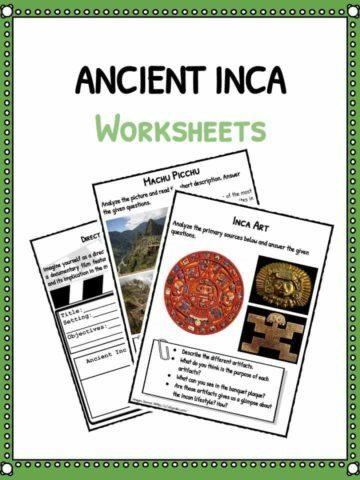 In this activity, students must shade their home country BLUE and modern day Mesopotamia GREEN. Afterwards, answer the given questions. Students must analyse the primary source below and answer the given questions. Chart task. 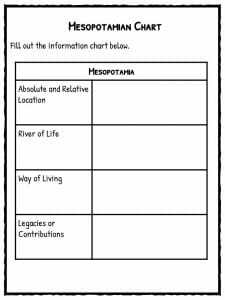 Using the chart provided, students must list the achievements of the Mesopotamians and on the second column cite how these contributions are still beneficial to us today. Picture analysis & write up task. Create your own empire task. Students must create their own civilization. 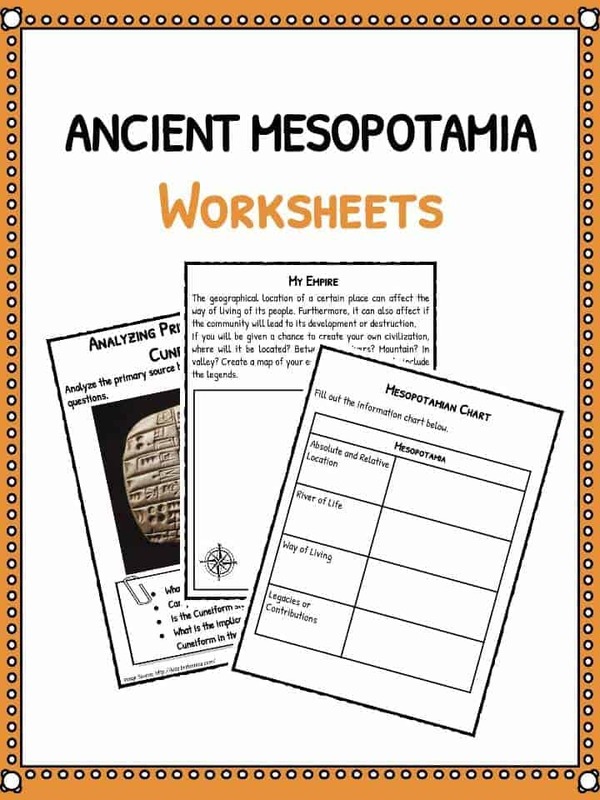 Fill out the chart on the Ancient Mesopotamian civilization. 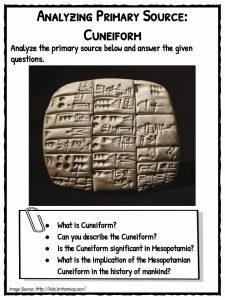 Students will tackle this Ancient Mesopotamian quiz in the form of a word search which students will complete using the knowledge gained from previous activities and quizzes. 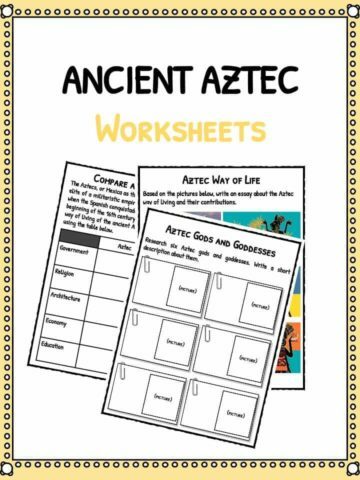 Students must Compare and Contrast the way of living of the Ancient Mesopotamians and modern day people using the table provided. Have a clear understanding about the history of the Ancient Mesopotamian civilization. Complete a number of quiz and fill in the blank activities to test their knowledge of the subject. Understand where they lived, their creativity and how they compare with life today. 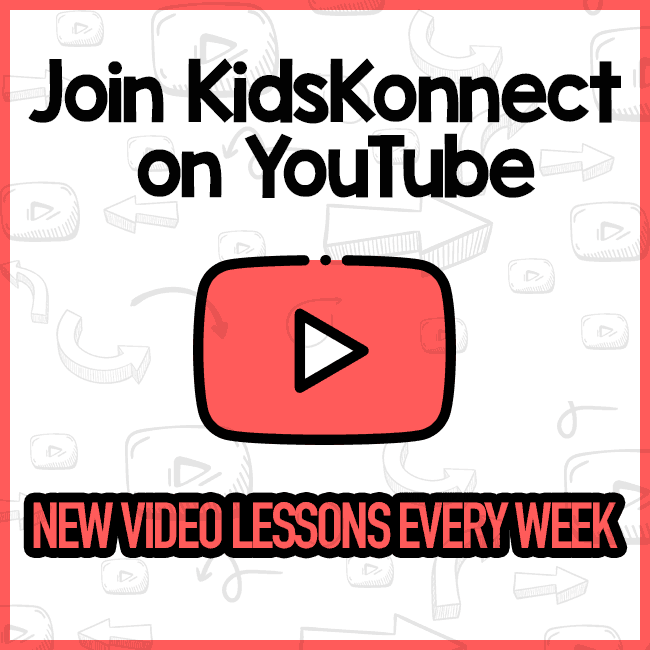 Understand facts and fiction based upon studies. Compare and contrast the way of living then and now. Study & analyse primary sources. 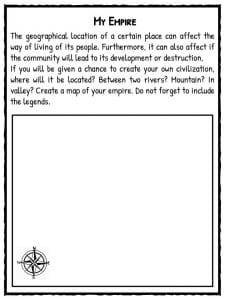 Complete a creative writing task based upon their own civilzation. Multiple core literacy skills are worked on and are the foundation of this study worksheet pack.